In this tutorial, I will show you how to create an Android JSON Parser. I have received this request numerous times and I will show the easiest way to parse JSON with Android without all of the extra code that confuses people. I will be grabbing the JSON data from the URL provided by the Yahoo YQL Console. I previously used this when I covered how to parse XML with Android. All of the code used in the tutorial is provided in a package to help you learn this stuff better. // The content from the requested URL along with headers, etc. I will definitely do some tutorials on how to make nice interfaces after I cover the basics. Up next ill start down that path with fragments. could you make some tutorials on how to use accelerometers and gps? I am learning android basic and found your tutorials to be one of the best! Keep posting Derek! Thanks! Thank you very much 🙂 I’m very happy to be able to help! I can’t see where onPostExecute(String result) is called. or how this method is called? Thanks for your great tutorials, makes learning easy. Following your tutorial I am not able to parse the Jason object that returns an array for example below is the JSON object and I am trying to get the rowID, which I am failing. Can you point to some good reading material to learn more about the such APIs? Found the solution 🙂 But still great tutorial. Great! I’m glad you figured it out. I haven’t really found a good book on JSON. I learned it by reading a ton of web page articles on the rules. The same is true with Android. There are many great Android game books, but very few on basic apps. You basically just need to learn a little Java to be able to make Android apps. Here is my Java video tutorial. All you need to watch are parts 1 – 7, 9, 11 – 18 and parts 1 & 2 of my Design Patterns video tutorial. Some times when you pull a json feed from Yahoo cbfunc is at the beginning of the feed. This deletes that from the feed. Hi Derek, what if I have a php file that connects to a mysql database and receives (and encodes the data to json) and then returns the json to data to android? What should I write in the httpPost to allow the device to connect to my PC and access the php file ? Is there any specific address for android to connect the PC or should I use my I.P address followed by the directory to the php file ? Awesome tutorial btw, thanks a lot! Sorry my bad English, cheers from Portugal ! Thank you 🙂 I’ll cover that topic in detail soon. There is a lot that goes into it, so I’ll do my best to make everything very understandable. Do you have any examples of a form input field which will query based on the YQL query and parse the JSON? For instance, doing a search for stock code-microsoft (instead of hardcoding it in your example) and listing out the stock high/lows as what you showed earlier. If you have other tutorials to suggest, I would be keen to learn from it. Thank you 🙂 I didn’t do that, but you can do that pretty easily if you spend a bit of time playing with the possible queries. You could definitely query the whole yahoo service with a bit of messing around. It sounds fun! I’m trying to read multiple entries (for example: yahoo.finance.quote where symbol in (“YHOO”,”MSFT”)) with the code you provided but whenever I run the program the fields are blank. How do you read more than one item using JSON? The top code doesn’t belong here I don’t think. It isn’t the main.xml. Superb tutorials but please we want to know parsing through gson……and how collection work in android. Great tutorial. I tried following your example and am using YQL to read json from another api. Up to the point of this, I am fine. Based on YQL formatted view, I noted that it goes by query->results->quote and followed by the JSONstring e.g symbol,DaysLow etc. Any suggestions on how should I be editing the code to read the running number and move onto the JSON string? Derek, let me rephrase my question as I have looked at the logcat. Can you explain what does this code do? I am getting org.json.JSONException: Value Z’ of type java.lang.string cannot be converted. It deletes the string cbfunc(); from the beginning of the result if it is there. I’d like to know, I’ve a jsonObject to parse, but it’s rendered like an array, so i do not know how to parse it. I can have many items in that array, so i’d like to parse it in an arrayList, and store it in an SQLite database. Any idea on how to do it? Still searching on my part! Sorry i couldn’t get to you quicker, but I’m glad you figured it out. hi.. I have a project on android which is to control raspberry based robot using android WiFi. can u help me with the codes for creating an android application for this project. 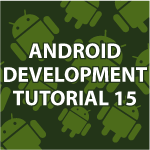 Thanks for the wonderful tutorial series…..
I’m going to be getting into controlling electronics with Android soon. Great I’m glad you fixed it. The manifest isn’t updating for some reason? Thanks for this tutorial i run correctly using the yahoo console..
when i run the the logcat says..no value for json object. I’m going to make a tutorial on how to set up web services with php. Sorry it is taking so long. Thanks for another well understood lecture. Thank you 🙂 You are very kind. I just saw your tutorial – it’s great! Thanks. I continue to get an error back from Yahoo saying connection refused. Any clues? Thank you 🙂 I’ll have to test it again. Maybe something changed on Yahoos end? When I used YQL ‘test’, it first used HTTPS – I tried that received the refused error. Then I removed the ‘s’ and got the same thing. I substituted ‘google.com’ for the URL and that worked fine other than it didn’t like the ‘post’ method. Very weird. In any case your teaching style is excellent and your tutorials are very informative. Thank you for notifying me of that. I’ll look into it. I also plan on making a new Android tutorial that will cover everything i missed plus update everything that has recently changed. Hi Derek – just a quick update – this think worked from my house – not from my office – for some reason from my office yahoo reports blocked however when at home it works. Very weird. Thanks for all of your help and support. That is very weird? Thank you for telling me. Thank you 🙂 I’ll be making regular Java Android tutorials again hopefully starting this month so that I can cover what i missed and cover all the recent changes. Unfortunately I can’t see the values next to the text views.. I get something like this on the emulator. Good tutorial by the way. It seems that Yahoo changed the tags for its web service. I’m going to make a new web services tutorial next so that I don’t have to worry about it changing. I’ll get it up as soon as possible. Hi Jason, many thanks for a wonderful tutorial! Can I use this JSON parser for a login system (presumably I can query my webserver with the JSON parser and get a JSON response telling me whether the login was good?) Could you potentially do a tutorial on the best way to do a web-based login? Also, how does one best achieve session behaviour (as in PHP) when navigating about the application as a signed-in user?